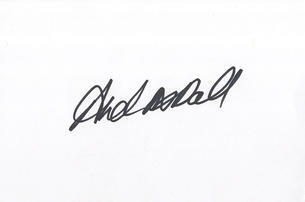 This is an In Person signed 5.75" x 4" white card by the Australia Test Cricketer. Andrew Barry Sneaky Yates McDonald (born 15 June 1981 in Wodonga, Victoria) is a former Australian Test cricketer who plays for South Australian Redbacks, and who made his Test debut in Sydney on 3 January 2009, against South Africa. McDonald also represented Australia at under 19 level and has played for the Prime Minister's XI. He is an allrounder who bats right-handed and is a right-arm medium-fast bowler. McDonald was captain of the Australian A XI which will take on South Africa in October/November 2012.